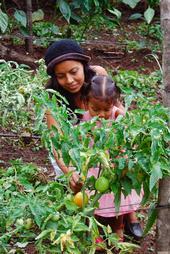 Woman farmer and child in tomato field in Central America. 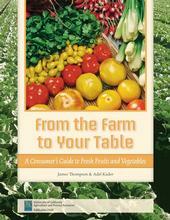 From broccoli to watermelon, California farmers grow more than 400 agricultural commodities. In 2011, California was the primary producer of almonds, artichokes, dates, figs, raisins, kiwi, olives, cling peaches, pistachios, dried plums, pomegranates and walnuts— accounting for nearly 100 percent of each of these crops grown in the United States. When Americans think of “agriculture,” California may not be the first state to come to mind. But the Golden State — just this one state — produced nearly half of all fruits, nuts and vegetables grown in the U.S. in 2011 (source). Some hae meat, and canna eat . . . Harvest bins of citrus fruit sit in the Food Bank warehouse aisle between shelved pallets of canned beans, pasta, and other canned and dry goods. And some wad eat that want it . . ."
The words are old and a little hard to understand, but they tell a story that's as true today as when the poet Robert Burns spoke them back in the 1790s. They were old words even then. Always, it seems, there are those of us who are fortunate enough to eat well and those of us who go hungry, even in a country as rich as ours.